Established as Kauai's principal port in 1930, Nawiliwili was named for the Wiliwili trees that were once abundant in the area. 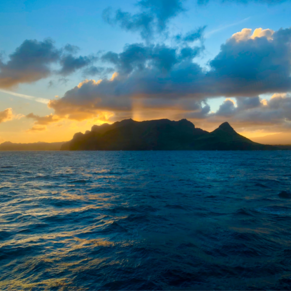 Cruise ships make port in the picturesque harbor, which is overlooked by the Kauai Marriott Resort & Beach Club. Visitors enjoy the crystal clear waters and pristine beaches Hawaii is famous for, while in Nawiliwili. Loved the Smith family Luau and river cruise to the grotto here. I booked directly through Smiths Kauai. An old and authentic Luau. Great food and show. Transportation is available to the Luau when you book, at a fraction of what the taxi fare is. Waimea Canyon in the early morning was breath taking! It truly is the Grand Canyon of the Pacific. Shipwreck beach was the perfect place to finish our vacation. If you go when the king tides are there, where a one piece, clothing is not optional but the current and tide pull of the ocean doesn't know that! I was in the water for about 15 minutes before I realized nature was winning and wanted my bathing suit bottoms as a trophy. What a beautiful place to see! 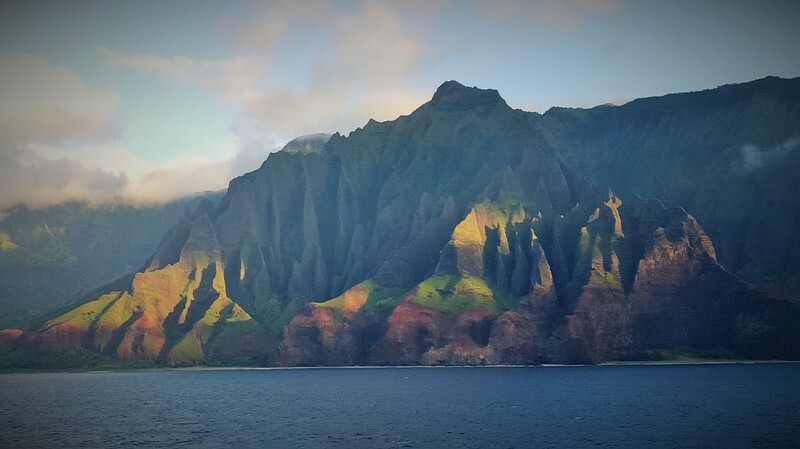 We sailed around the Napali coast in the morning on the Pride of America. It was worth the wake up (10:30) the cliffs and the valleys were so lush and green you will never see anything like it. You must take pictures here when you pass. It is photo album worthy. Surprisingly one of my best shots is when we went to the opposite side of the ship where we got the coast and the ship in. When you dock you are right by some mountains and a dock where some shipping containers are. The actual port was industrial. When you get off the ship there is a short walk to Kalapaki beach which is stunning. We passed that we never actually went to it. Also there are shops that have a lot of great souvenirs including the abc store ( you will become very familiar with that name. I got a king Kamehameha statue. I also got a couple of comfy t shirts and a wooden surfboard with the Hawaiian islands carved into it in the shopping center. I also did a helicopter ride booked through Island Helicopters. Our tour guide Issac was amazing can't go wrong if you get him. It was unbelievable and informative. 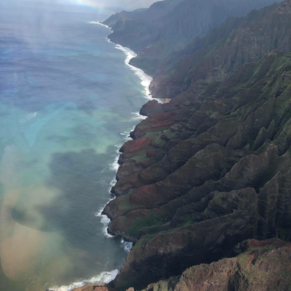 We went through Waimea canyon and flew passed the Napali coast. I ought it was impossible, but it was even more impressive. Waimea canyon is redish because of the iron oxides in the volcanic rock. Or is also partly green with plant life. It was a sight to see. You also pass many waterfalls including the Jurassic park waterfall and the fantasy island waterfall. All through this your tour guide is telling you what everything is though your headphone. You can also ask any questions you want through the microphone. Issac knew everything about the island. Overall our time in Kauai was fascinating and very enjoyable. I hoped you liked my book of a review cruisers! If you go you have to do something here. This was my favorite island. We attended the Smith Family luau. Juan, our tour operator from Gray Line was great! We rode in an air conditioned motor coach bus. The ride up to the Luau was great. Juan gave us a short lesson in the Hawaiian language, the history of Hawaii and he shared many of his childhood experiences growing up on the island with us. We also saw "the Sleeping Giant" and saw wind surfers. It was great! The Luau and show was great and very entertaining. Although I did not watch the unearthing of the pig, I saw where it was buried and saw it being unearthed from a distance. It was served at dinner, and my sister and others said it was delicious. We saw the beautiful grounds while riding on a tram. The grounds are beautiful! Service before, during and after dinner was wonderful. This was one of the best tours I have ever been on. Beach was walking distance from the boat but they also have free shuttles to the shopping center witch is about 3 minute walk from the beach/ Lovey place for beach and shopping. 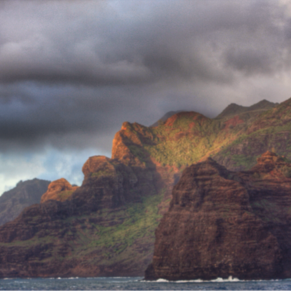 3 of 5 shore excursions in Nawiliwili, Kauai. There are currently 0 discussions about Nawiliwili, Kauai.